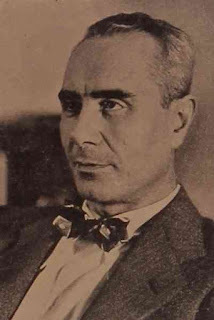 Aram Haigaz was a familiar name in the Armenian literary scene of New York and a popular writer in the Diaspora for more than six decades. Born Aram Chekenian in Shabin Karahisar on March 22, 1900, he studied at the elementary school of his hometown. He would eventually become a survivor of the Armenian Genocide. In the summer of 1915, the Armenian population of Shabin Karahisar, some 5,000 people, rejected the order of deportation, set fire to their homes and fields, and climbed up the mountain that shadowed the town, where the remains of an old Roman fort served as their protection. They had taken food and animals with them. However, after a desperate resistance of almost a month, they were forced to surrender by famine. Only a handful survived, including Aram Haigaz, whose brothers, father and other relatives perished. He survived by converting to Islam and living as a Muslim, as many other young boys in those days, until he escaped to freedom. His memoir Four Years in the Mountains of Kurdistan (1972; translated into English by his daughter Iris Chekenian in 2015) described his life and servant, and how he grew from boyhood to youth among Kurdish tribesmen and chieftains. After the end of World War I, the young survivor escaped to Constantinople in 1919. He was reunited with an aunt and spent some time in an orphanage run by American missionaries. He later attended the Getronagan High School for a year and a half. His literary essays attracted the attention of his teacher, the famed writer and critic Hagop Oshagan. He sailed for the United States in 1921 and settled in New York. He worked as an apprentice photo-engraver at The Daily Mirror newspaper and studied English at night, voraciously reading world literature. He started contributing to Armenian publications in 1922 and took the pen name Aram Haigaz, after the name of one of his elder brothers who had died in 1915. He married and had two children. He would publish ten books in his lifetime, as well as scores of essays and reviews for Armenian newspapers and magazines throughout the Diaspora. His first book, however, would be H. Baghdoyan’s English translation of his memoir on the resistance of Shabin Karahisar, The Fall of the Aerie (1935, reprinted in 2010). He would continue working on the history of the self-defense and collecting testimonies, which he condensed in a book, Shabin Karahisar and Its Heroic Struggle (1957). Other than stories from the old country and his years of tribulations, from the very beginning he started writing humorous short stories and vignettes of contemporary life during his time in Constantinople and then in the United States. His natural, conversational style made him a sought-after author. He collected his stories in several volumes: The Call of the Race (vol. I, 1949; vol. II, 1954), Four Worlds (1962), Hotel (1967), Yearning (1971), Live, Children! (1973), and Happiness (1978). Aram Haigaz received various literary awards, and his literary jubilee was marked in 1972 in the United States, Canada, and Lebanon. He lived in Rego Park (New York), and passed away in Manhattan on March 10, 1986, a few days before his eighty-sixth birthday, from complications of pneumonia. The Soviet regime did not allow the publication of his work in Armenia during his lifetime for political reasons. In the past decade, several books of stories and articles scattered in the press have been posthumously published in Yerevan, as well as an anthology of his short stories and a collection of letters.